Accuracy of information is never more important than during an emergency. 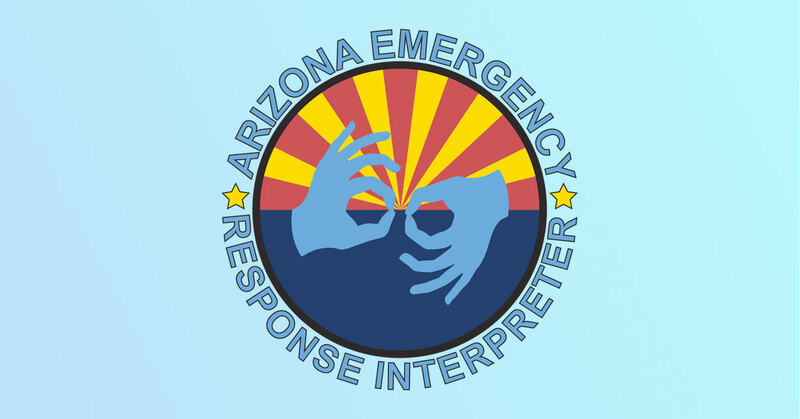 Victoria Bond is the Interpreter Outreach and Development Coordinator for the Arizona Commission for the Deaf and Hard of Hearing. She is working to ensure that the roughly 25,000 Arizonans whose primary language is ASL, along with the roughly one million more with hearing loss, are able to get timely and accurate information. The Emergency Response Interpreter Credentialing program (ERIC) is the first of its kind in scope for training and dispatching American Sign Language (ASL) interpreters and Communication Access Realtime Translation (CART) captioning providers to effectively communicate with the Deaf and hard of hearing in case of fire, flood, nuclear disaster, power outage or extreme heat. Bond worked with subject matter experts to develop the vocabulary which uses “classifiers” – signs that describe how something looks or functions – along with finger spelling so the word is recognizable if it comes up in writing, like print news or instructions. The training, described as a 3-day intensive, allows interpreters to work with the same experts to learn the new vocabulary and add new words as needed. Then, they are trained to work with emergency responders and understand the workings of incident command and disaster relief. ERIC was put to the test for the first time in April of this year when the Sawmill fire was declared a Type-1 disaster. The southern Arizona wildfire, one of the state’s largest, burned for more than a week, scorching roughly 80 square miles of drought-stricken scrub and involved multiple agencies. Bond related the story of a Deaf woman who lives in the impacted region of the Sawmill fire. She decided not to attend a community meeting expecting it would be inaccessible to her. Her neighbor promised to bring home good notes. Upon arrival, her neighbor spotted an ASL interpreter, texted her Deaf neighbor who scrambled to attend. With an ERIC-trained ASL interpreter present, she had full access to the information. She was absolutely thrilled and expressed gratitude to the interpreter and the rest of the team. The Deaf resident told 3 other Deaf individuals that the meetings were accessible, so there were Deaf attendees at the 2 subsequent community meetings. Historically, Bond reflected, Deaf and hard of hearing community members would go to meetings like these with the assumption that they wouldn’t have access, but would glean whatever they could from printed materials and writing notes with the team managing the disaster after the meetings. What sets Arizona and ERIC apart at times of disaster is the central call-out system. ASL interpreters and CART operators are activated at the same time as the rest of the disaster relief system. Many states are working to train interpreters and CART providers in appropriate vocabulary but no other state activates them through the central call-out. “It’s quicker and more efficient,” Bond said. So far, three CART providers and eleven ASL interpreters have been trained.